The general public will always argue over which show they prefer. Strictly Come Dancing, or X Factor? Both shows began their first season 14 years ago, and have been competing with each-other ever since. The general consensus is that X Factor has lost a load of viewers, who seem to have gone over to watching Strictly instead. Although when you look at the actual numbers, that doesn’t seem to be the case at all. Below, we created an infographic which shows the seasons average amount of viewers in millions. In Season 1 (2004), X Factor had a 1 million lead in its viewing figures over Strictly. Looking at the latest season which finished in 2017, it’s now at an all time low with over 4 million less viewers than what Strictly Come Dancing achieved that year. These figures started to drop from Season 8 onward. Even so, at the same time, Strictly Come Dancing also started losing viewers for 4 years straight before climbing back up. It wasn’t that people switched from X Factor to Strictly, it seems more likely that people stopped watching both these shows entirely. 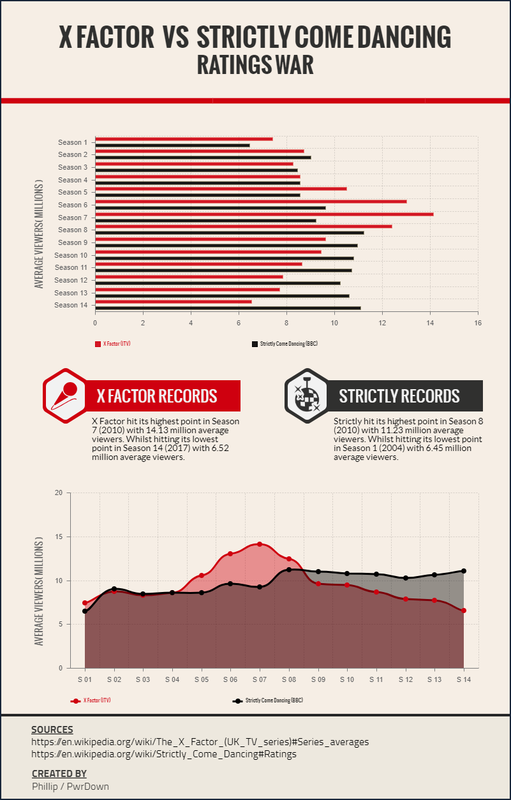 But X Factor took the biggest hit of the two, losing around 3 million viewers in Season 9. It also took more significant drops compared to Strictly, which has now caused the show to constantly stir things up by switching to new formats in attempt to lure in new viewers. By Christmas, we’ll be able to see how Season 15 did. Will it drop to an all time low, or rise from the ashes? If you wish to use this infographic in your own publication, you are entitled to do so as long as you link back to this post.